He was the second child of late Narayan Umak. I was heard that he did not believe in god and rituals. He loves to spend his life free, my dad was the 3rd child and were working hard to run the family. Suresh never looks after them, he left village early at the age of 15 years of his and start doing weird and unusual, unlike things. His personality was god and impressive 6'5 feet. The big brother of family and idler no more interested in supporting his mother Indira. My dad used to work at landlord from morning to late night to earn bread and butter, his dad died at his age when he was 5. They were 4 siblings, two sisters, and two brothers. Sindubai she was the first child of my grandmother and Suresh uncle was the 2nd child, 3rd was my dad and Tarabai she was the last child of my grandparents. Love and respect in Suresh were quite good, his love towards me was more enough than his own children. He always used to say "you are handsome guy of our family, I would have to spend money on you to make you actor but we are so poor" he always used to say "do something special in life"
Care for family always shows by him, as far as I could be remembered. Lot of time I had heard that he use to help people if there is any war or fight or financial need. Bad things in his life happened when he was 30 years old. He went to his elder sisters village, the enemy of my elder aunt Sindubai had a dispute with neighbors and as he was the strong builder, he killed one person in the war and went to Jail. My aunt had a big farm so she helped financially and he won the case from high Court after four years and released from the jail. That time I was just in 2nd grade. I could remember the day when he came back to home. When I saw him, he was more muscular than before. His voice was strong like Lion and weight around +70. His elder son was running pan tapari his father had set up, he modified into bigger one and business was at peak especially at the time of summer. There was no single understanding in between him and his wife, both always use to fight for simple reasons from early days of their marriage. when he was in jail, my grandmother used to help his son in pan tapari and after few years he earns a lot of money and bought a new house adjacent to our old house. The land he had bought was not the holly land villagers think. He was rich person by that time, after some years he has to sell his land because of he was going through losses, lost money in casino and few days later his wife suicides thinking there is crack in love, which was big loss for him, first time I saw him crying though he did not like her throughout in his life. My grandmother's love for him was true, she did a lot for him. She was great devotees of May Durga, every day she used to go to the temple for prayer for his betterment. Sometimes she could cry, she was a very hardworking lady of 70s. When her husband died at the age of 40 she had 8th months old baby girl Trabai in her womb. My dad's role was very crucial in their families, he used to work on the farm, he left his education from the 4th grade, and start working on the farm. At his early age of life, he did very hard work and running entire family was his first priority. Mr. Suresh was opposite of him. He never works like my dad, never in his entire life. More often behavior illegally. The life after the jail was so critical for both brothers Ramesh and Suresh. He was in jail for 4 years, I am writing as much as I could remember and whatever I have heard about him. One day I went jail with my dad to meet him, he was in white clothes I could still remember that day, I was just five or six-year-old baby boy. When he released from the jail, everyone was so happy in our family including me, I was his favorite boy. He was kind of filmy man, his own style was impressive. He spent around 4 years in jail. There was good bonding between him and me. He always inspired me to do unique and quality things in life, I have done a lot of business in my childhood then he used to say, " just stick to one thing in life, you will get growth." His heavy voice used to makes me afraid sometimes and others too. He was very famous personality and well-known person in our and around villages. When I left for Pune, things were getting changed, he had been giving more pressure on the mind to think more about his past and the things had taken bad way and fate failed to support him. Due to this, his memory weakness increased. His son's care was not good enough. I feel myself very lucky person that people in my hometown gives me and my family such a great respect to my dad and my family. When I was a boy, I could remember all those things that had happened in our village. Population in my hometown is consist of around one thousand. Village has only two Durga temple, but hundred years ago it was only one. That first old temple had broken down into the pieces and took his Durga Maa at his own house and set up new temple in the yard. After some period of time, my dad rebuilt the broken temple and placed new Durga Maa. This reconstructed temple just in right near the bus stop in front of the main road. That time I was a child, doing my schooling. I could remember all the things that had happened that time. Whenever Navratri use to come, my school friends and I all use to give a helping hands in the temple during the festival. Lot of fun we use to have, specially in the last day of the festival-Visarjan time. All day we use to wait for dance. crazy and wild steps that everyone could remember. Since I left my village and started staying in Pune for my further education, I could not attain Navratri every year. This time I had decided to go to my hometown and attain it. I have spent almost 8 days in this Navratri and felt very happy and blessed. I took lot of time to think over my past and a bit on the future planning. My dad is a great devotee of Maa Durga and people respect him a lot. In below pics, my dad carrying Ghat to the River after all the prayers. This time its got late and bad thing took place- a black magic must had done by someone. As per my dad, he told me that, the Ghat Visarjan should be done before 12 pm or after 3 pm. Otherwise bad thing may happens particularly with the person who carries the Ghat and today same thing had happened with my dad due to delay in Visarjan. Their heart was blocked by a bad soul attacked, it was last longer for 2-3 mins. In the Visarjan, around 500 people includes boys and girls takes part in the celebration. Sometimes 70 % people of the village. Nowadays a screw run entire festival, the entire village contributes Cereals, Wheat, Oil and all other required things for Mahaprasad. And before one day of Dashera all villagers have Mahaprasad, the entire village come down to the temple for dinner. Its kind of holy Prashad... Jai Ambeeee! Jai Durgeeee! New plantation in the yard of hometown to grow Love for a longer period of time. The plant is the first source of oxygen and its useful factor for the human being. I always like to live in fresh air and stay healthy. In my hometown, the lot of farms are in surrounding but no forest area and no hills. In the village, only small flowering plants but no big trees. So I have decided to plant a flowering plant in my yard. Long back ago my grandmother had planted a tree of Bel plant. The plantation is very important, we could reduce global warming and we are the hell responsible everyone for today's pollution. When we go to the forest area, we see a lot of fresh oxygen and feel so different and comfortable than our daily life. Most of the time, I plan on outings, especially in dam site, the lot of hills and waterfall in the monsoon. When we go such places, we feel more enthusiastic and energetic. The yard is what we can make our home beautiful planting small trees, most of the flowering plants it keeps the healthy environment. My home does not have the big yard as compared to the western country has. Grow love longer, if you want to cherish to memories, this is one of the best ways. My grandmother died in mid-2006. She had planted a tree and its now big one now, Bel plant is considered as one of the holy plants, leaves are especially donated to Lord Vishnu and his Pind. 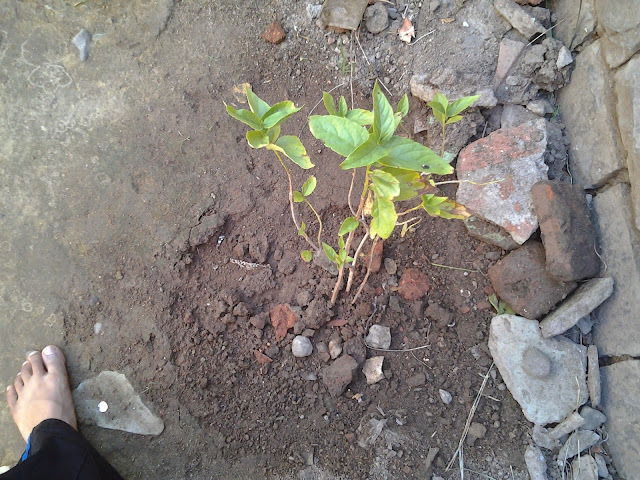 Today I have planted Parijat plant. I had bought it from the city in rs 40. And my dad planted just right front of the kitchen window in open space. It is a very beautiful flowering plant. Flower of this plant gives very nice fragrance in the morning, makes the happy mind when you wake up in the morning. I had this concept in my mind since long back. So this is the symbol of love for both me and my dad. I will always remember this sign of our love.